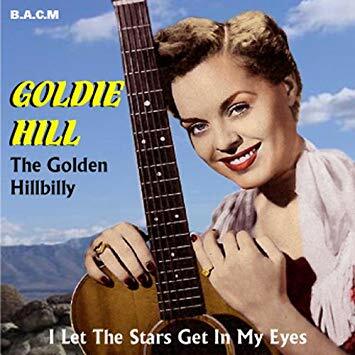 Goldie Hill (January 11, 1933 – February 24, 2005), born Argolda Voncile Hill, was an American country music singer. She was one of the first women in country music, and became one of the first women to reach the top of the country music charts with her No. 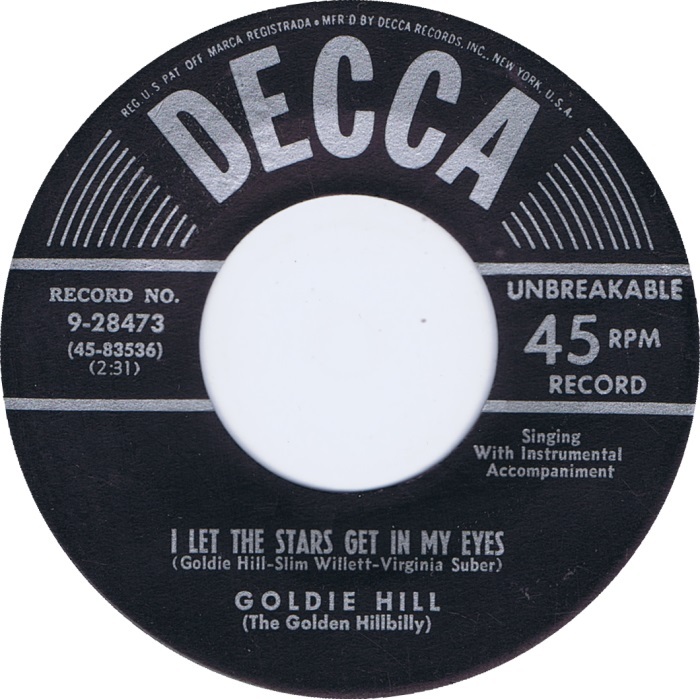 1 1953 hit, "I Let the Stars Get In My Eyes". Along with Kitty Wells, she helped set the standard for later women in country music. She was the only daughter of a musical family in Karnes County, Texas. The radio was one way to block out the daily backbreaking work of picking cotton. Goldie soaked up the popular country music of the era and developed a talent for singing. Early on, Goldie's older brothers Tommy and Ken left a life of cotton picking, determined to make a name for themselves in country music. Within a few years Webb Pierce recruited Goldie and Tommy to his Nashville-based touring show where they were backing up Hank Williams, Johnny Horton, and Webb Pierce. Goldie also auditioned as a solo artist for Decca. 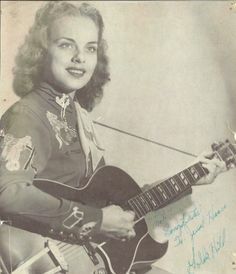 Billed as "the Golden Hillbilly," she scored a number one hit in 1953 with her second single, "I Let the Stars Get in My Eyes," originally written by Tommy for Kitty Wells. Among her other charting tunes were several duets with either Ernest Tubb's son Justin Tubb. She was named "Best Female Artist" by the magazine Country Song Roundup. Goldie performed regularly on US radio and television showcases, such as Louisiana Hayride, Ozark Jubilee and, crucially, the Grand Ole Opry. She also co-starred in the television series Country Tune Parade, with Ernest Tubb, and was well received on various tours. In 1957, during a Philip Morris package tour, she met top country star Carl Smith. Her musical career had plenty of life in it when she turned it all down when they married on 19 September the same year. 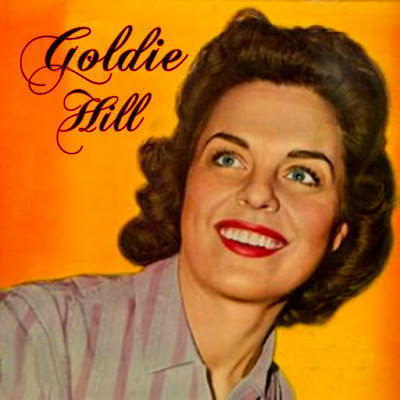 From 1957 through 1968, Goldie Hill pursued music to a much lesser extent, choosing instead to concentrate on raising a family. (She subsequently had three children, Carl Jnr., Larry and Lori). She gave almost no live performances after 1957, but continued to record sporadically. In 1959 she charted once on another duet with Red Sovine (“Yankee Go Home”), and in 1961 “Lonely Heartaches” was a minor hit. Every year or two during the early 1960s, Hill would release new recordings and in the late 1960s, she made stronger attempts at reviving her career. But as her husband Carl Smith’s long, illustrious career began to wind down both he and Hill became more involved in life on their 500-acre Tennessee ranch and horse farm south of Nashville. In 1968, after some persuasion, and recording as Goldie Hill Smith, she recorded two albums for Epic and gained a minor chart hit with ‘Lovable Fool’, before once again retiring. In 1977, Smith still a major star, also retired and the couple became noted for raising horses on their ranch. Many country fans regretted the fact that they never recorded an album together. Commenting years later about her retirement she replied ‘I was never that ambitious. I never missed it a bit. I was never hooked on it’. On February 24, 2005, Hill died in Nashville’s Baptist Hospital of complications from cancer. She was 72 years old. 14 HOW'S THE WORLD TREATING YOU? Goldie Hill was a highly influential presence in the country music field and was in fact only the second female artist to enjoy a No. 1 hit on the country charts with her Slim Willet answer disc 'I Let the Stars Get In My Eyes' released in 1953. This wonderful set from Jasmine contains the two complete albums 'Goldie Hill' and 'According To My Heart' which made their CD debut on this collection. 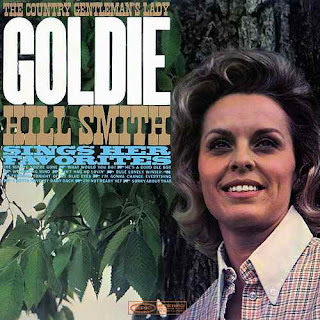 Goldie's style would prove to be very influential and can be heard in artists such as Loretta Lynn and Tammy Wynette. A big thank you to Xena Dress @ ACM2 blog for original post.